I decided to use a spare partition of 5 MB to test the latest release of Vector Linux (5.9.1) as I have not used Vector Linux during the last few years. Installation went without problems and I now have to working systems installed on my 1 GHz desktop. I am pretty impressed by the system, it has a nice look, boots fast and does not use a lot of resources. Unfortunately, at least the desktop with Fluxbox is slightly misconfigured after installation. It provides some eyecandy offered by the OS X like dock wbar that can be used for starting different applications. Some of the applications, however, are not even installed in system. In addition, I don't fully understand the point of using a lightweight desktop environment or a window manager with KDE applications as default applications for e.g. email. 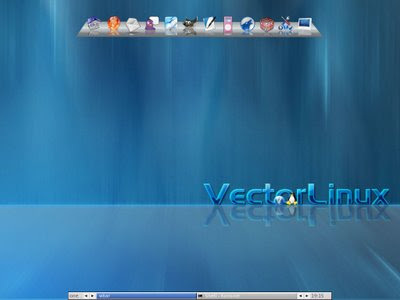 Anyway, Vector Linux provides an easy way to get a fully usable system running on an old computer. I'll return to Vector Linux after I have gathered some more experience with this release. its nice software Vector Linux and i will try it on my computer.